Polypropylene is a plastic material that is heat sealable, that is, when two pieces of PP films are heated to melting temperature, under pressure, they dissolve into each other, and when cooled the two pieces are bonded permanently as a single piece. PP also resists temperatures of sterilization (about 256°F). It is also one of the cheapest plastic materials. Other plastic materials and laminates may also be used for purposes of mushroom cultivation, but cost of many other high temperature plastic materials is many times higher than that of polypropylene. Our bags are made of virgin resin. We have developed other uses for scrap PP as well as spent bags of our clients. After deciding the various resins that are needed for bag making, we test the resin components by blending each and the blend as a whole, in mycelium growth medium. Several shiitake strains are tested and inoculated into the resin agar mixes and observation of growth characteristics are compared with control. Control is an agar plate with no resin added and inoculated with similar shiitake strains. All components approved for use in our products must not have any influence on mycelium growth. One batch of Resin pellets were blended in agar and sterilized together. Another batch of resins were tested and blended in agar sterilized separately. 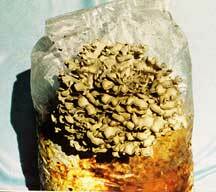 Mycelium grown in resin agar mixes were fruited for mushroom. On the other hand, we have additives that can be blended into a resin and the final film will have an antibacterial, anti fungal effect. This process is commonly used in plastic processing. All bags are individually quality controlled and packaged. All machinery in bag conversion and our manufacturing processes are manufactured by ourselves.